The Joe Gibbs Racing No. 18 M&M’S Red, White and Blue Toyota Camry Scored the Maximum Number of Eight Playoff Points by Winning All Three Stages and the Race Win. ● Kyle Busch started first and finished first. ● The M&M’S Red, White and Blue driver was passed for the lead before completing lap one, but he dug in and reclaimed the top spot on lap five. ● Within the first 35 laps Busch reported that the car’s handling was simultaneously getting tighter and more loose. He attributed the tight issue to a buildup of tire rubber on the track and noted that that car was mostly loose at the entry to the turns, particularly in turn three. ● The team used the caution period on lap 36 to make air pressure adjustments, change four tires and add fuel. Quick work in the pits enabled Busch to maintain the top spot. ● A caution on lap 83 gave everyone the opportunity to come down pit road for fresh tires. Busch noted that he liked how his car was handling on the short run, so the team elected to make no changes. He restarted in second place and was in front by the time he reached turn one. He cruised to the conclusion of Stage 1 to score the stage win. 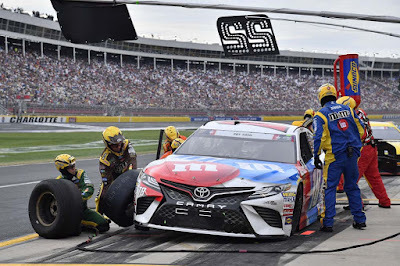 ● Busch noted at the conclusion of Stage 1 that the car was starting to turn better, so the team elected to only change four tires and add fuel during the break, once again getting the M&M’S Red, White and Blue Camry off pit road first to maintain the top spot for the start of Stage 2. ● Busch started first and finished first. 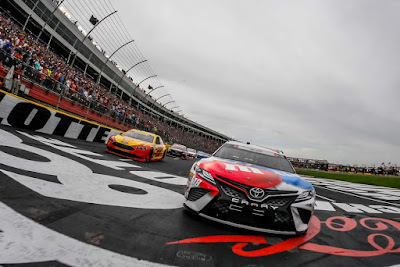 ● The 2015 NASCAR Cup Series Champion picked up in Stage 2 right where he left off at the conclusion of Stage 1 – taking the lead and then extending it. 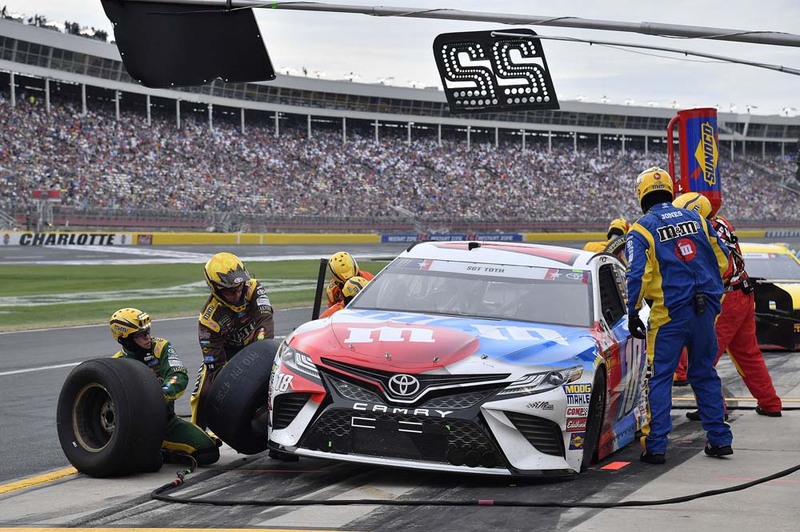 ● Busch relinquished the lead during a round of green-flag pit stops that began around lap 157. On lap 159 he brought the M&M’S Red, White and Blue Toyota to the attention of his crew, who changed four tires and added fuel. A handful of drivers were operating on different strategies, but it did little to deter Busch, who raced his way back to the top spot on lap 174.
earning another 10 bonus points. ● Busch was leading when caution was displayed on lap 225. He noted that the M&M’S Toyota was starting to handle a little loose. Anticipating that the track would continue to create a tight-handling situation, the team once again made no adjustments while changing four tires and adding fuel. After a tight race off pit road with teammate Denny Hamlin, Busch was declared the leader for the restart. ● During a caution on lap 258 Busch reported that the handling of his car was getting to be a bit more challenging. Crew chief Adam Stevens directed the team to make air pressure adjustments, change four tires and add fuel. The pit crew continued to rise to the challenge, getting Busch off pit road first to maintain the lead. ● The M&M’S Red, White and Blue Camry was on cruise control for the next several laps, maintaining a healthy lead through to the end of Stage 3. ● At the conclusion of Stage 3 Busch reported that the car was “really good” and, if anything, was starting to get just a bit snug. The team elected to go with no adjustments, simply changing four tires and adding fuel. Busch returned to the track the way he left it, in first place for the start of the final stage. ● During the opening laps of Stage 4, Busch quietly and methodically set up a comfortable pace with yet another healthy lead. ● The strategy for the final 100-lap stage was simple for the M&M’S team, who had dominated the race: Keep the car up front by splitting the final stage into two 50-lap runs. ● Busch pitted for the final time on lap 353, taking four tires and fuel and no changes to a car that had been flawless the entire night. 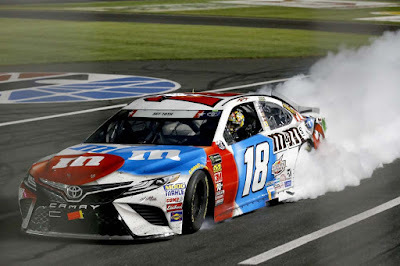 ● From there, Busch’s M&M’S Red, White and Blue Toyota Camry cruised to victory as the final stage went all 100 laps without a caution, capping a dominating performance. 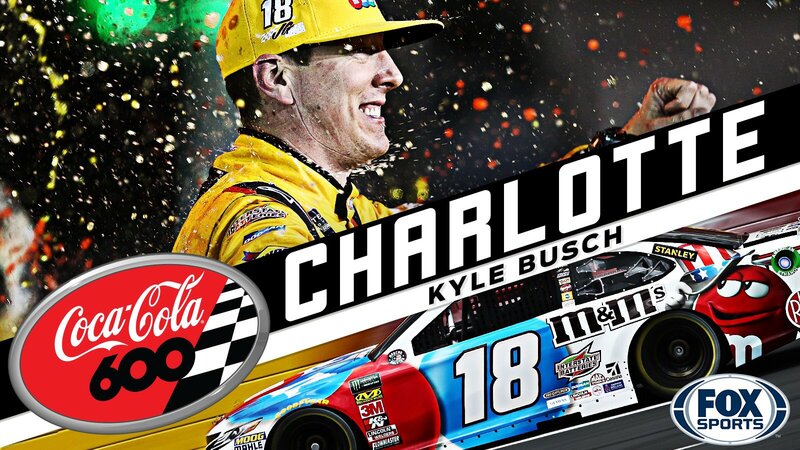 ● Busch won the Coca-Cola 600 to score his 47th career Monster Energy NASCAR Cup Series victory and his fourth of the season, scoring the maximum number of eight playoff points by winning all three stages and the race win. ● Busch led four times for race-high 377 laps. With his laps led in the Coca-Cola 600, Busch surpassed the 15,000 laps led mark in his Cup Series career. 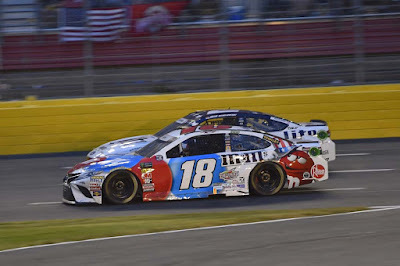 ● This was Busch’s eighth top-five and 10th top-10 finish in 13 races contested so far in 2018 season. 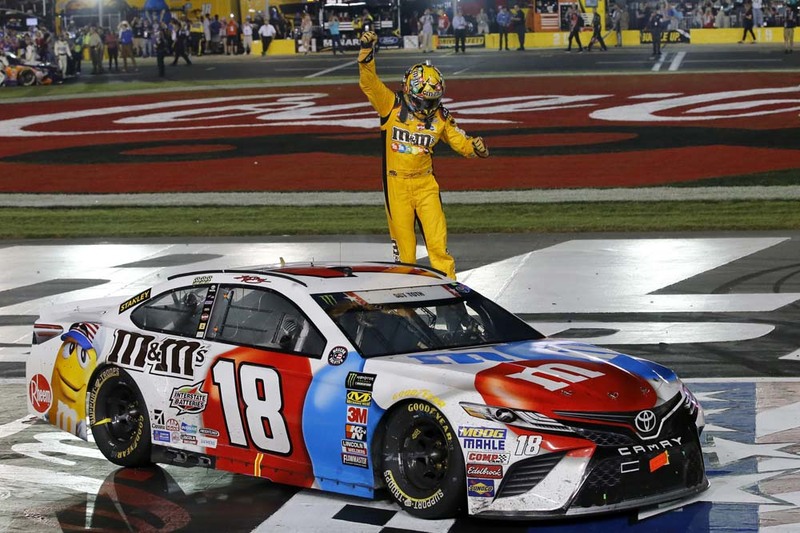 ● The win was Busch’s first points-paying win at Charlotte and his first-ever trip to victory lane in his 29th starts there. 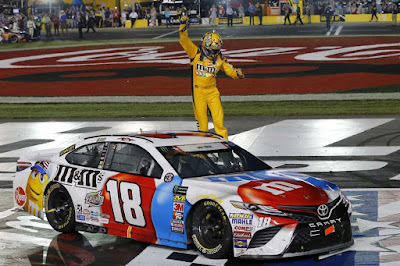 ● The win also made NASCAR history as Busch became the first driver in NASCAR history to win at all tracks at which he made at least one start. Busch has now won at all 23 current tracks on the Cup Series schedule. How special is winning this race for you? Your team came through flawlessly tonight, didn’t they? First driver in the modern era to win at every active track, what does that mean to you? The next event on the Monster Energy NASCAR Cup Series schedule is the Pocono 400 on Sunday, June 3 at Pocono (Pa.) Raceway. The race starts at 2 p.m. EDT with live coverage provided by FS1. Kevin Harvick’s 5th #MENCS #Win In 2018! Harvick Wins Fourth #NASCAR #MENCS Race! France Family Exploring Possible Sale of #NASCAR?